Yeah, okay, so it's not a running movie, but it looks funny and after this week, week two of two weeks at home with a three year old, I need funny. And anyway, we cross-train on Wednesdays; some of us even spin. So there. Plus, young Dennis Quaid. Swoon! I did, however, have pasta. Pretty boring again this week - pasta with chicken and Trader Joe's pesto sauce, plus some beets on the side. If you run and like movies, and you're actually reading my blog, you knew this one was coming. In the four years since it was made, the documentary Spirit of the Marathon has become a must-see movie about running, particularly if you're training for an endurance event. Because, c'mon, running 26.2 miles is absurd. And yet I'm drawn to the challenge again and watching the trailer makes me a little misty, I gotta admit. So what's for dinner? Well, since there will be a fair amount of cooking going on this weekend, I'm keeping it simple: vegetable radiatore and turkey bolognese, both from Trader Joe's. Easy and good (and the pasta sauce has carrots in it - don't tell the 3 year old!). By the way, a big thank you and congrats to my 12 (handmade) days of Chrimstas - runner's edition - raffle donors and winners. I had more items up for grabs than donors between Dec. 1 and 17, so some folks won more than one item. Thanks to Sammie, both Amanda Fs (I know two Amanda Fs! ), Laura, and Margaret. I hope you enjoy your goodies, all courtesy of generous Etsians. I have a few additional raffle items that have been donated over the last couple of weeks so stay tuned after the holidays for another chance to donate to win! (Not that you have to wait to donate!) And in the meantime, Happy Holidays! Holy moly, what a week! Since I'll be home (well, I'm always home but you know what I mean) with the wee one during the last two weeks of 2011, and because I'm self-employed, that has meant I've tried to crank out as many orders as possible in the two weeks and three days I had to work this month. I honestly lost count by about Tuesday but I believe I sent out a dozen orders this week, which is insane; to compare, I'm lucky to get 2 to 3 orders out each week during normal business conditions. And for the most part, considering that higher than usual volume, things went pretty smoothly. I did threaten myself that I was considering quitting at one point during a reprint but, you know, what else am I going to do? Anywho, I did manage to make all my workouts this week: strength training on Monday, buddy run on Tuesday, cardio on Wednesday, coached track workout on Thursday (waking up for all of them at 5:30 am, I might add). 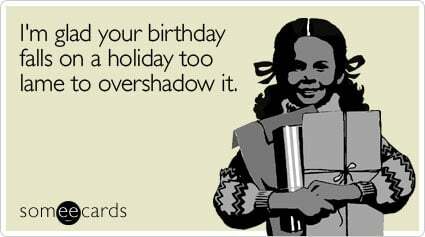 And tomorrow I'll run 8 miles and then stuff my face at an honoree potluck immediately after. I'm looking forward to it. But I'm not as prepared as I have been the last couple of Fridays. No pasta tonight. Neal gave me a couple extra hours this evening to wrap up work by picking up said wee one and taking him to Chipotle, bringing home a couple of carnitas tacos for me (with rice! y'know, for the carbs!). 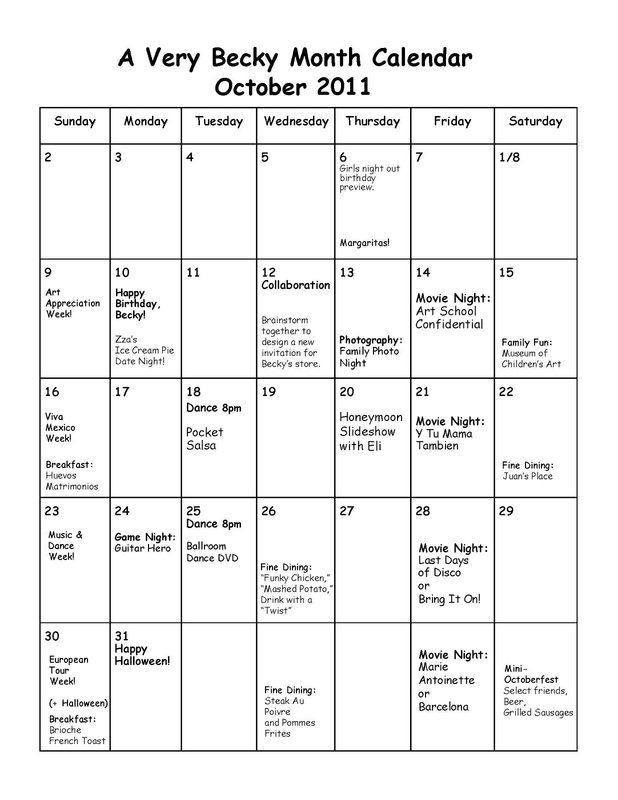 I'm not sure if we'll watch a movie, but if we do, I've been a little in the mood for The Last Days of Disco. No, you're right, it's not really a running movie, per se, but there is that one scene where she goes running in the park. In her trench coat. Okay, so it's a bit of a stretch but it's been one of those weeks. Mainly, I think I just want to see the scene at the end ever since I heard Love Train on the radio not too long ago. (I love how this clip has captions, you know, so you can sing along.) I just love that scene, don't you? I'll be back next week with a proper "pasta and a movie" post. 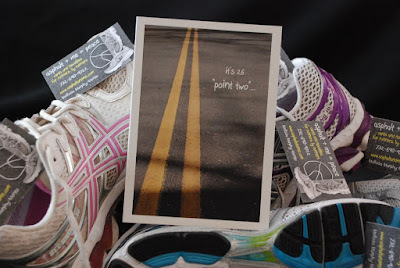 In the meantime, just one day left to get in on my 12 days of a runner's Christmas raffle! Donate by tomorrow! Winners announced on Sunday! ...another beautiful fused glass pendant by Elayne Isaacs! Because, after all that running and sweating and sudsing up with a bar of trail runner sport soap, you might want to enjoy a night out and this purple pendant would be just the thing to pair with those black skinny jeans you can finally squeeze your booty into! As with the last pendant Elayne donated, this one has been added to a simple, black choker which you could easily switch out for a chain of your own, and will arrive packaged in a purple organza gift bag. Keep it for yourself or gift it! To be entered in the raffle to win this or one of the other goodies up for grabs, just make a donation of $5 or more before Saturday, December 17th. This is the final day of my 12 (handmade) days of Christmas - runner's style - but the raffle will be open to all who donate through the rest of this week. And I'll be back on Friday with another round of pasta and a movie. Yep, I'll be running on Saturday, and on Christmas eve, and on New Year's eve! Cancer doesn't take any time off for the holidays so why should we? Amirite? 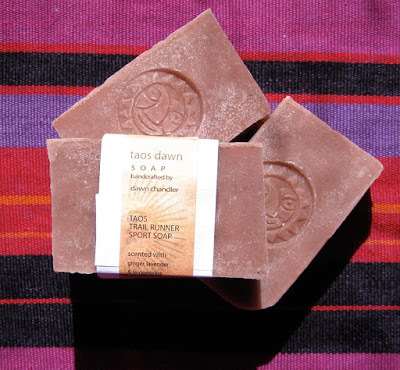 ...a bar of trail runner sport soap by TaosDawnSoap! I think your running buddy might be trying to give you a hint. 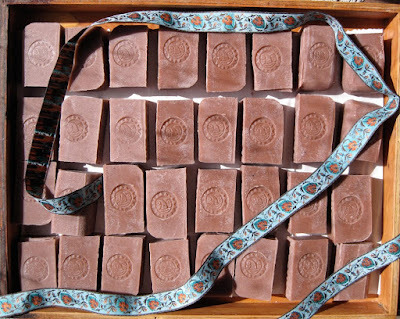 ...lavender, ginger and lemongrass.The soap is made with saponified oils (coconut, vegetable and olive), distilled water, finely ground bentonite clay (for a lovely lather). Sounds perfect after those long Saturday runs, doesn't it? In addition to an entire line of soaps, Dawn is also a painter! Check out her newest shop. And for a chance to win this soap or one of the other 11 items in the raffle, just make a donation on my Team in Training fundraising page. Just one day left (and then another week to donate) - stay tuned tomorrow for the 12th and final day! 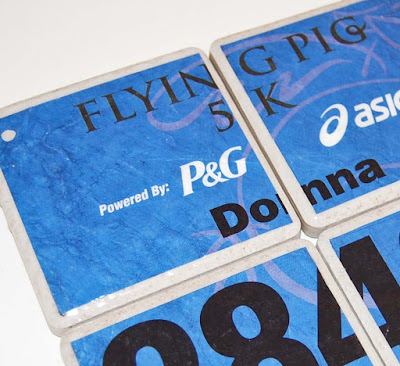 ...a set of custom bib coasters by 26MileStones! 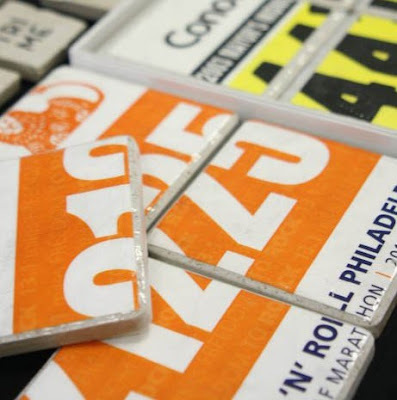 Talk about a clever way to display your race bibs! 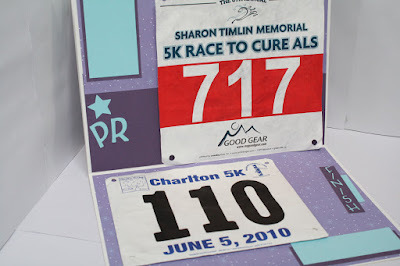 You send your bib to Allison, and she transforms them into these amazing, commemorative keepsakes that you can use! Allison also makes magnets and Christmas ornaments. Plus, she's an 11-year alum with TNT, currently training for her second triathlon with the organization! It's amazing how many runners and endurance athletes I've met through this process who have some connection to Team in Training. As usual, to be entered in the raffle to win either a gift certificate good for a set of custom bib coasters or one of the other items up for grabs, just make a donation by December 17th. Since I started this raffle a week and a half ago, how about a little reminder as to how I plan to handle raffle entries? If you donate $25-$99, you will receive matching entries per dollar donation, so for $25 you get 25 entries, for $38 you get 38 entries, and so on. For a donation of $100 or more, you get double entries, so $100 = 200 entries, $125 = 250 entries. If you've already donated, donate once more (any amount) and you get matching entries for this donation PLUS your previous donation. Stay tuned tomorrow for day 11! Doesn't it look good? Plus, Campbell Scott. Swoon. For dinner, we're having this Santa Rosa Valley Salad, more of a rice dish but loaded with carbs all the same and oh so yummy. The leftovers are just as good, too. Tomorrow - 8 miles! I'm telling you, after trying to organize another raffle for an in-store event next weekend, I'm newly blown away by the generosity of the Etsy sellers I contacted for this round. Take a look at Meli's shop to see all of your options, should you be the lucky winner of this raffle item. And if you're Christmas shopping, Meli also has some really adorable coat racks and key racks. To enter, all you need to do is donate $5 (or more!) to my Team in Training fundraising campaign. You could win today's item or one of the other 11 goodies up for grabs between now and December 17th. Stay tuned tomorrow for day 10! 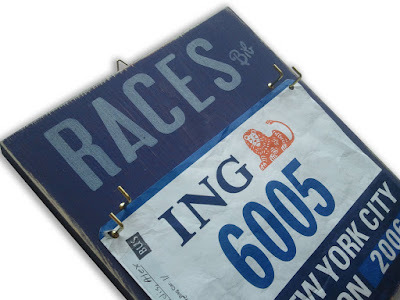 ...a race bib scrapbook by LauraElaineDesigns! 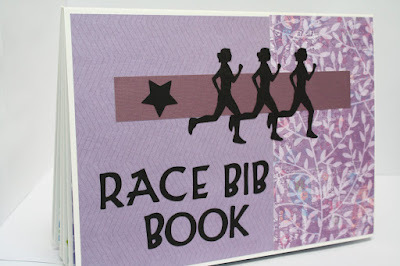 And not just any race bib scrapbook - a purple race bib scrapbook (TNT color! 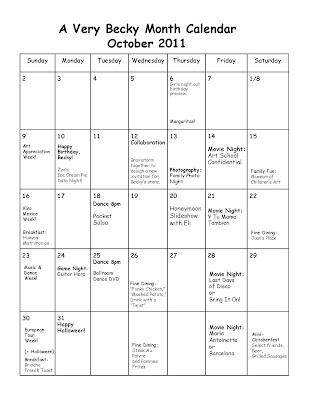 You probably don't need reminding by now, but just in case...). I believe Laura is having baby #2 right about now, so she sent me this scrapbook well in advance and let me tell you, there's a lotta love put into these. 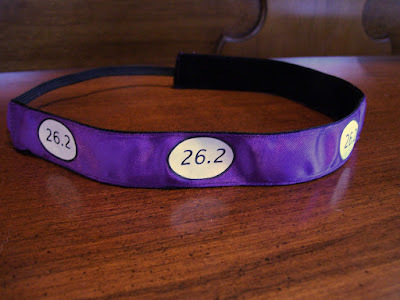 Which will make archiving those race bibs really easy (well, you know after the hard part - running the race!). 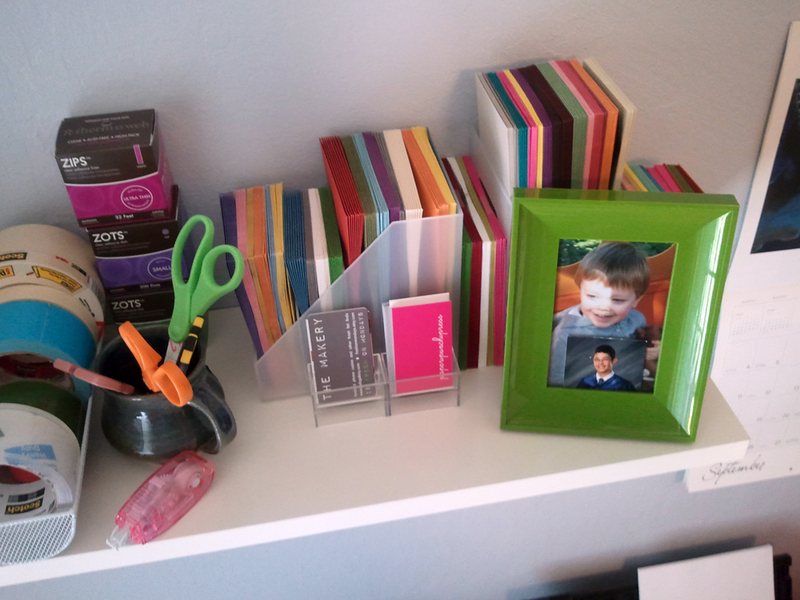 Laura has a ton of great, pre-made scrapbooks in her shop (for triathlons, too! 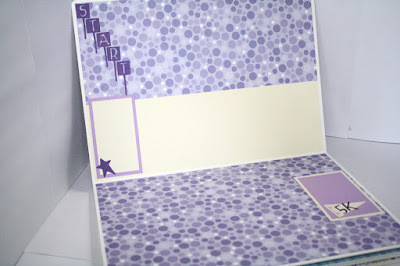 ), as well as individual scrapbook pages and runner die-cuts if you're more of a do-it-yourself person. If you'd like to be entered in the drawing to win this race bib scrapbook (or one of the other great items up for grabs) just make a donation in any amount of $5 and up before December 17th! And stay tuned tomorrow for Day 9! The pendant comes in a soft blue bag with a yellow ribbon and then gets tucked into a little gift box similar to the ones in the image above. Susan definitely has that wow factor down! 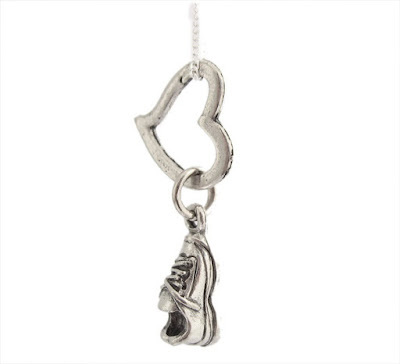 This pendant would be perfect to keep but is also definitely gift-ready. 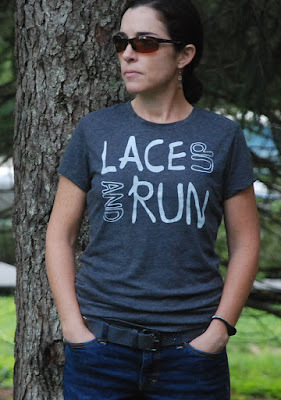 If you'd like to be entered in the 12 (handmade) days of Christmas - runner's style! - raffle, all you have to do is make a donation in any amount of $5 and up! Winners will be announced on December 18th! Stay tuned tomorrow for day 8! 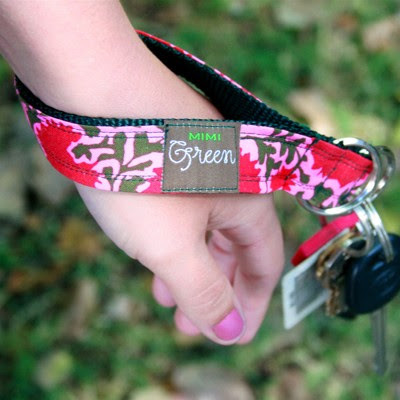 ...a key ring wristlet by ShopMimiGreen, featuring Team in Training colors (including old school TNT green)! Wouldn't this be the perfect thing for carrying your keys, etc., post run, while you wait for the rest of your teammates to cross the finish line (because you're that fast)? Or to take to those 5:50 am track workouts - you'll be able to find this colorful wristlet in the early dawn light! Not a runner? No problem - this key ring wristlet would be great for running errands. ShopMimiGreen does have a shop on Etsy (which is how I found them) but operates primarily from their independent website these days, where you'll find designer dog collars, leashes, and a lot of pictures of irresistibly cute pugs. 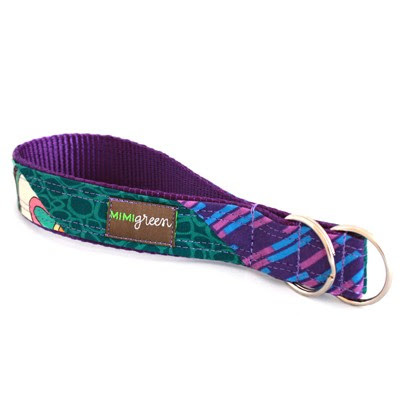 All of ShopMimiGreen's items are 100% handmade in the U.S. and as they say on the site, "your dog loves designer collars." But you probably already knew that. And I think you'll love this designer wristlet, too. If you'd like to be entered in the raffle for a chance to win this or one of the other 11 items up for grabs between now and December 17th, just hop on over to my fundraising page and make a donation (just $5 gets you in...but of course, feel free to donate more for more chances to win!). Stay tuned tomorrow for day 7! 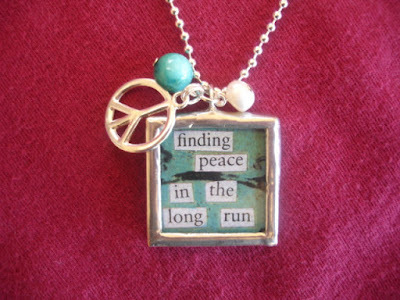 ...an "I heart running" charm necklace by Michelle Hartney! 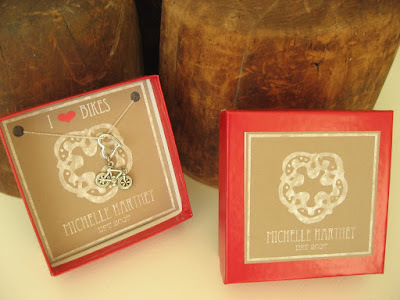 When I was searching Etsy for just the right raffle items to solicit, I was thoroughly charmed (wocka wocka) by Michelle's running necklaces. I asked if she'd be willing to donate this one and she said yes! Once again, I'm truly amazed by the generosity of Etsians (and runners - I don't think it's a coincidence, do you?). And check out these wooden geode Christmas ornaments - how unique would that be on your tree this year, eh? As with the other 11 items up for grabs in this 12 (handmade) Days of Christmas runner's style raffle, all you have to do to enter to win is make a donation (just five bucks!) on my Team in Training fundraising page. Stay tuned tomorrow for Day 6! ...a hula hoop? 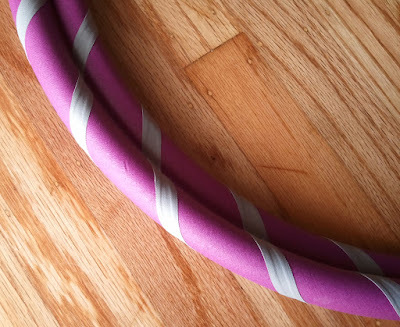 That's right, and not just any hula hoop...a travel hula hoop by Oakland-based Whoopkat. Kat even made a purple and gray one for me (TNT colors, in case you need reminding)! I was going to include this in my first raffle, but then I thought, wait a second, runners need to do cross-training, and hooping is great for those core muscles, so why not include it in this more runner-friendly raffle? 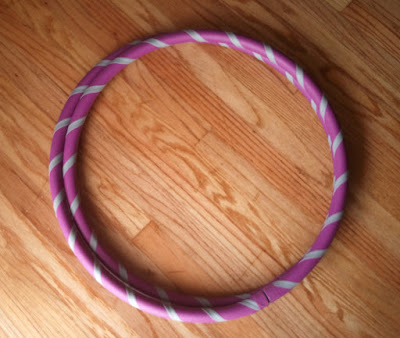 I cleared it with the coaches, too, so as long as you're not attempting to break any world records or anything, you can safely incorporate a little hooping into your cross training schedule should you be the lucky winner of today's raffle item up for grabs. Nope, no hooping here. This took several takes (did I mention I'm solo-parenting my three year old this weekend? ), and an earlier version did include about four attempts to get the hoop going. By the time I got it going I'd slowly turned my back - and backside - to the camera. That version will be deleted, thank you very much. Anywho, if you'd like to "whoop it up" just make a donation in any amount of $5 and up between now and December 17th (you can check out the other items up for grabs here). Stay tuned tomorrow for day 5! ...a wrap bracelet from TheRunHome! 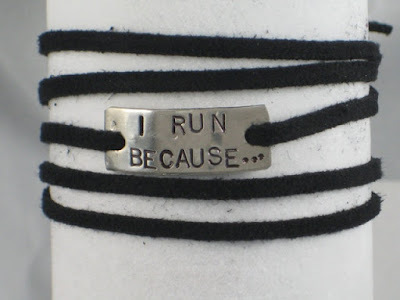 I initially contacted Debbie about her runner's necklaces but as she suggested, why not offer something a little different and go with a bracelet instead? And the message is perfect, since we're all running for so many reasons, not least of which are the hundreds of thousands of folks battling blood cancers every day, in addition to all of our individual, personal reasons (makes me think of how my mentor Laura started her blog, devoting individual posts to different reasons she runs). For a chance to win this wrap bracelet (or one of the other eleven items up for grabs between now and December 17th) just hop on over to my Team in Training fundraising page and make a donation in any amount of $5 and up! Stay tuned tomorrow for Day 4! 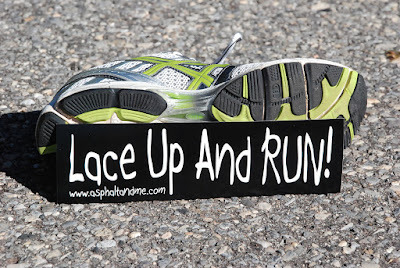 Wow, who knew getting back into running would be so good for my blog? (That said, is anyone still reading?) As soon as I joined up with Team in Training again I thought about all the running themed movies I watched the first time around, some more inspiring than others. I remember Without Limits, one of two movies I watched about running legend Steve Prefontaine, being one of the more inspiring (we'll get to the less inspiring running films in a later post). If I hadn't moved to Berkeley (right before the movie was made, incidentally) I probably would have transferred to U of O (since I was initially living in Bend, OR), where Prefontaine trained with Bill Bowerman. How I swooned for Billy Crudup back in the day... And look at that, Parenthood's Monica Potter plays the romantic interest! Anyway, instead of "dinner and a movie" how about we start a little "pasta and a movie" series since I'll be doing a little carbo-loading on Friday nights over the next few months? Now, I wouldn't normally make a pasta dish this heavy the night before a run, but since I'm solo parenting this weekend (and nursing a minor back hiccup so I won't be running tomorrow anyway) and had to throw together something we could eat after dance class tonight, I made one of Paula Deen's several crock pot macaroni and cheese recipes. 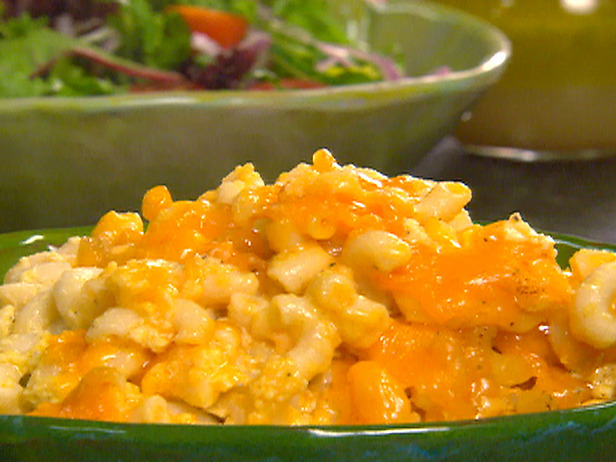 It was alright - I like her use of cheddar cheese soup, which makes me nostalgic for a cookbook I had as a teenager that used a different Campbell's soup in each recipe, but I'm not so sure about the eggs. I used vegetable radiatore and served it with peas, one of about two vegetables my three year old will actually eat. Now let's see if I can make it through the entire movie in one night. ...a bunch of stuff from AsphaltandMe! I don't know exactly what Etsy seller Melissa has sent me (her package is on its way as I type) but I understand day two goodies will include a t-shirt, a bumper sticker, and three cards! That's a lotta clever running loot that will go to one lucky person who makes a donation to the Leukemia and Lymphoma Society by December 17th! You can get a sneak peek at all of the 12 items up for grabs in this second raffle right here. Stay tuned tomorrow for day 3! And, as if that wasn't enough, for every one of these purple headbands purchased, Leanne will donate $1 to the Leukemia & Lymphoma Society! So you can make a donation to my fundraising efforts directly to qualify to win this headband (or one of the other fantastic 11 items up for grabs) and/or purchase a headband or two. 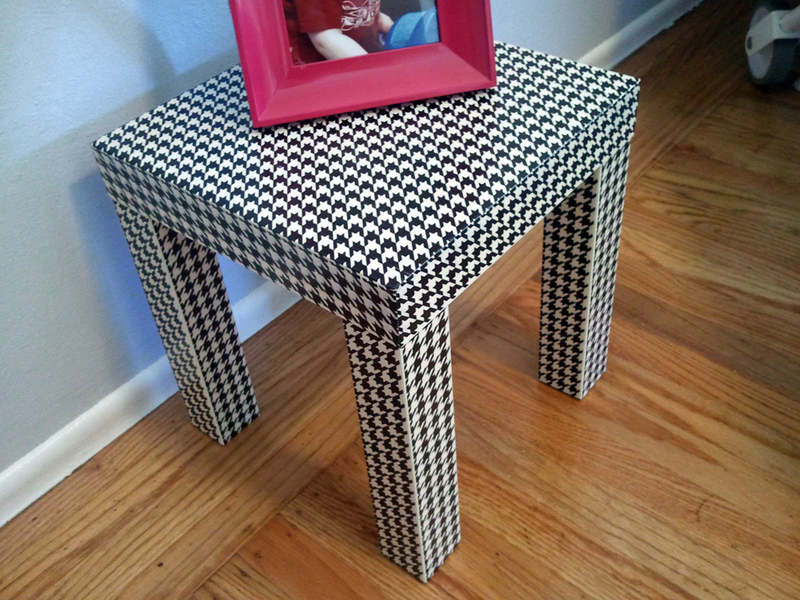 As a sidenote, I purchased this houndstooth (it matches my phone case!) headband and love it! 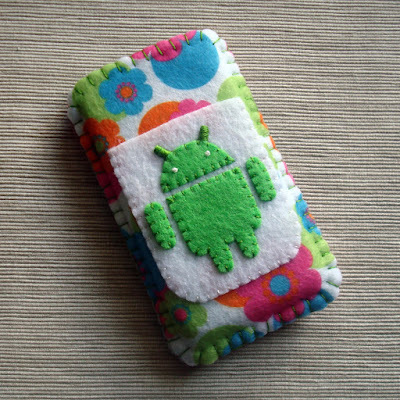 The lining is sort of velvety so it stays in place really well, no pinching, no pulling. I was Leanne's 100th sale so I got a free headband - a promotion I learned about by giving her a thumbs up on Facebook and following her on Twitter. You should too! Stay tuned tomorrow for day 2! First things first: I have two raffle winners to announce! Following the lead of my amazing mentor Laura, I entered all my raffle entry numbers (1155 total in all) on Random.org and here are the two numbers I got - for the eco spa gift set, #184, the prize goes to...Brian & family! 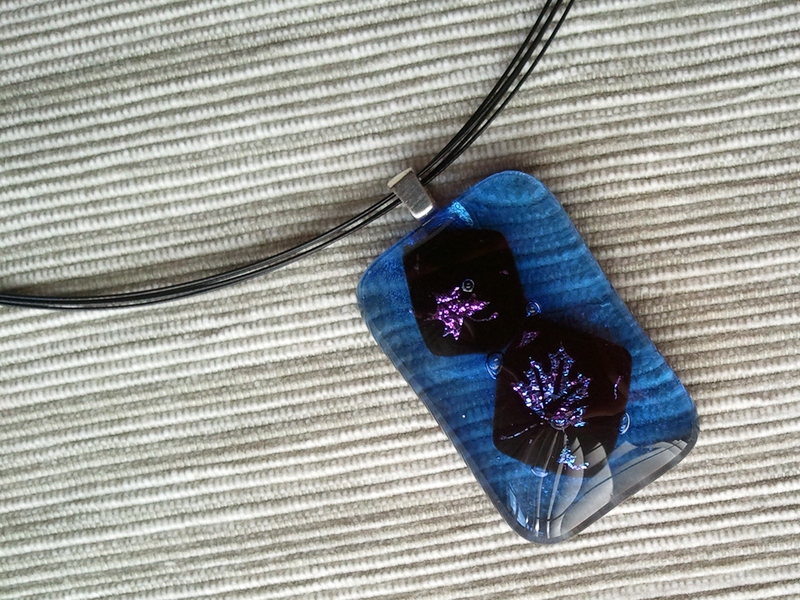 For the fused glass pendant, #753, the winner is...Meredith! Thanks again for donating and I hope you all enjoy your goodies! Now, traditionally speaking, the 12 days of Christmas begin on Christmas day (or the day after). 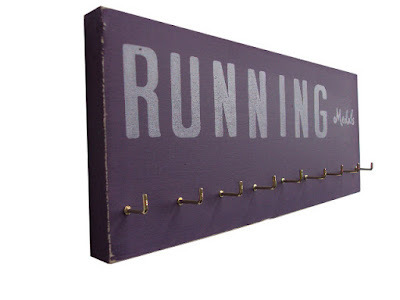 But this handmade 12 days of Christmas series - runner's style - begins today! As part of my fundraising efforts for Team in Training, I organized another raffle open to anyone who donates to TNT in my name between now and December 17th. That date is "recommitment", when I have to sign a lot of forms reiterating that yes, I plan to run 26.2 miles in Oakland on March 25th, and yes, I'll raise at least $1800 for TNT between now and then (or they can charge my credit card for the difference). In fact, I'd like to raise that minimum $1800 by recommitment, so I'm making a second push to get additional donations before then. My first raffle included the above-mentioned spa gift set and fused glass pendant and I not only reached the $500 mark by yesterday as I'd hoped - my donations went beyond the halfway point! 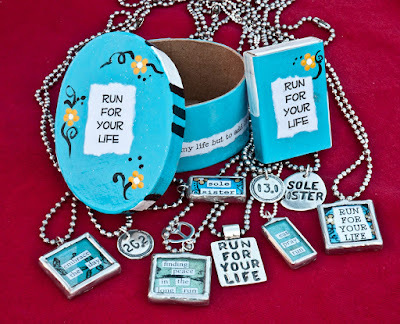 This time around, I have not one, not two, but TWELVE handmade items up for grabs, all donated by generous Etsy sellers, all geared toward runners! I'll give you a little peek of all twelve items today and will follow this up with an individual post each day highlighting one of the donated items and the fabulous seller who donated it. If you've already donated, donate once more (any amount) and you get matching entries for this donation PLUS your previous donation. Stay tuned for one more post today and every day hereafter until Dec. 12th to learn more about individual raffle items! a gift from the fire added to my TNT November 30th raffle! Generously donated by Berkeley-based Etsy seller Elayne Isaacs, I picked this one because it has a lot of purple, the signature TNT color that you start seeing everywhere as soon as you begin training. 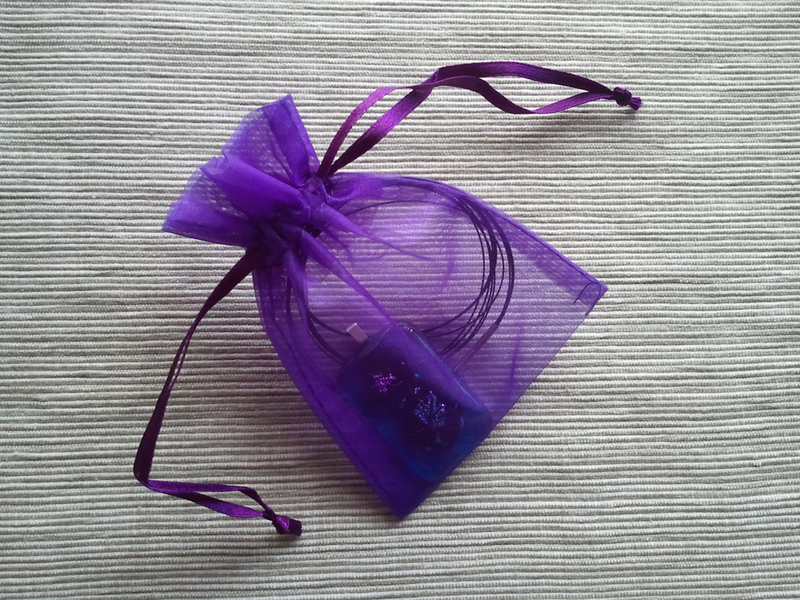 I added a simple choker chain and packaged the pendant in a purple organza bag. Again, great to keep for yourself or give as a gift! One raffle entry for every $25 you donate! Elayne's shop is called Gifts from the Fire. You'll notice it's empty. Elayne is a retired teacher and longtime potter who moved into fused glass about a year ago. She had several pieces picked out for me and when I mentioned I was interested in perhaps choosing one with a little purple in it for the TNT connection, she brought out a box full of equally gorgeous pieces. Don't you think she should fill her shop with more pendants and glass pieces like this one? I sure do! Thanks again, Elayne! I put out a call for donated products or services to my two local Etsy teams yesterday (SF Etsy and the East Bay Arts Collective) and so far have received several donations of items I'll be raffling off as an incentive to get folks to donate to Team in Training in support of my fundraising efforts as I prepare for the March 25th Oakland Marathon. Up for grabs if you donate between now and November 30th is an eco spa gift set by Berkeley-based AngelMade (you can also find Angel on Facebook), including a Spiced Lavender Foot Scrub Set, a Chai Spice-infused Coconut Oil and a Chai Spice Lip Balm (a $30 value!). You'll get 1 raffle ticket for every $25 you donate! Pretty swell, don't you think? If you don't want to pamper yourself after a little holiday shopping next month, I think this gift set would also make a great hostess gift, don't you, for all those holiday parties you'll surely be invited to? Check out my fundraising page for all the details! And a big thanks to Angel for this generous donation! Four years before I started this blog, I completed the Big Sur Marathon with the amazing support of Team in Training, the fundraising arm of the Leukemia & Lymphoma Society. I didn't have a connection to LLS or TNT at the time; I just wanted to run a marathon and I didn't know how to do that. Today I went to the 2012 season kick-off in San Francisco and was reminded of what drew me into the effort over ten years ago: in addition to the support and organization they provide to guide you through the nearly five-month long training process and of course the endurance event itself, it's hard not to be won over by the other runners, walkers, cyclists, hikers, and triathletes, the kind of research and progress the over $1 billion dollars has provided for, and of course the honorees. I've always been drawn to folks with a "mind over matter" approach to life and one thing I value more and more the older I get is enthusiasm. Despite battling a sinus-y head cold most of this week and recovering from a minor podiatric procedure on Tuesday, I was ready to complete our first training run after the kick-off. I was that pumped up and I'm looking forward to feeling that way over the next five months. Of course, I know it will be a lot of work and I'll have my ups and downs, over the course of training and during the marathon itself. That's where TNT comes in. I'll share as much as time allows right here on this blog. I also know, from my previous experience, that raising $1800, my minimum commitment, will be no easy feat. That's where you come in. Take a look at my fundraising page, won't you? And stay tuned for some crafty fundraising efforts over the next few weeks! In the meantime, while I can't find my original fundraising letter, I did manage to dig up my Big Sur Marathon recap letter (proof that I can do it!) that I sent out to donors several months after the race (I promise it won't take me four months this time around! And that was before I had a kid - what was my excuse?!). I thought I'd share it here as a nice way to begin again! Remember that check you wrote five, six, maybe seven months ago? The one for that little race in a big forest for a great cause? Have you often wondered what happened to your check or whether I actually made it through 26.2 miles alive? Well, as summer's end looms ever nearer and I hasten to finish a lengthy list of projects before another semester begins, I'd like finally to share my experience with all of you and let you know how very grateful I am for the support you all showed me during my five months of training for the big day. On the drive to Monterey, with a TNT sticker proclaiming "Go Team!" from the rear windshield, I listen to the Olympic Fanfare and Queen's 'We are the Champions'. At the marathon expo the idea of running 26.2 miles in less than 24 hours suddenly strikes me as oddly surreal and frankly kind of absurd. I'm finally in bed at 11:30 pm, after loading up on pasta and a couple of hours of preparation for the next morning. I wake up less than 4 hours later, catch the bus at 4:30 am, and enjoy the 45 minute drive along the very same course that I'm about to run back on…fortunately, it's still too dark out to really pay much attention to the hills. I wait 35 minutes to use a porto-potty, scramble to get my things together, and put what I don't need on a bus that will beat me back to Carmel by about five hours; I wonder if running is really the most efficient way to make it back. I'm nervous and excited; it's still surreal. I line up in the back. Some guy is on a microphone telling jokes in a futile attempt to take our minds off the inevitable. He eventually leads us through the National Anthem, sets about a half-dozen doves free, and warns us that it's almost 7:00 am and the gun will soon be sounding; I'm, meanwhile, worrying about the doves, circling above the man with the gun. Someone nearby reassures me it's loaded with blanks. And then suddenly it's gone off. You can tell how excited everyone is and we sort of lunge forward to a very anti-climactic start; it takes a full two minutes to actually cross the start line from where I am, but, eventually, I'm off. For the first ten miles, I feel completely in control; I'm actually really enjoying myself. We weave thru the woods for a couple of miles toward the coast. The weather is great. We cross Little Sur River Bridge; I can see the daunting climb to Hurricane Point ahead. I repeat coach's words as I get closer to the base of the two-mile ascent: 'be the hill, don't run up the hill, run through the hill.' I am the hill, I am the two-mile, really steep, doesn't seem to ever end, hill. I tell myself this is the biggie, I get through this and it's just fourteen miles of rolling hills. Finally at the top of the hill, I enjoy the one-mile descent in front of me to Bixby Bridge and the halfway point. I manage a smile for the camera, but the hill has brought up every little ache and pain. A strong headwind begins to kick in. The water stops look a bit deserted. I think I'm still within the five and a half hour time limit. I've run twenty miles before, but I seem to be hitting my wall. I start to walk up some of the hills because my knee is sore and my muscles hardly stable. Down to the final 6.2 miles…the real challenge begins. I'm reassured at the water stop that the wind dies down about two miles ahead, as the road makes its way inland toward Carmel. I'm in a great deal of pain, both knees hurt in different areas, my lower back aches, my shoulders are sore, but most of all, I'm so tired of running. It's been almost five hours. I'm worried I won't make it within the time-limit and start to feel impatient. I'm frustrated at the wind, frustrated that my body isn't working the way I want it to, and just frustrated at the length of a marathon. I'm wondering why thousands of years ago, those Greeks didn't choose a closer city to run to. Every emotion begins to surface. Another runner passes and, trying to be helpful, calls out, "You're having a bad marathon, too?" With the way my knee's hurting I realize this may be my one and only marathon, and there's no way it's going to be remembered as a bad experience. Just 2.2 miles to go and I'm determined to finish strong. At the top of the final hill, a race volunteer encourages us to the end, "At the bottom of this hill you'll turn a corner and be able to see the finish line just a half-mile away." The fact that I'm going downhill helps, but I really give it everything and feel like I'm picking up speed for the first time in about ten miles. Suddenly not so impatient, I really savor the last few strides, and as I cross the finish line and a volunteer hands me a medal, already the pain of the last 26 miles is starting to fade. Three months later, I struggle to get up early enough to make it to work by 9:30 am. Completing one three-mile loop around Lake Merritt, site of our weekly training runs throughout the season, is a challenge once again. Still nursing an injured IT band on the side of my left knee, I've put off any immediate plans to train for another marathon, although I've got my eye on a few less torturous courses. But in spite of the endless hills and the relentless wind, I'm glad I decided almost a year ago, to join up with TNT and achieve one of my lifetime goals. All selfish reasons aside, I'm proud to have accomplished something even greater for TNT, now a little closer to finding a cure for blood-related cancers. I was more or less on my own for 26.2 miles, but I can't say I didn't get a lot of help along the way. All of you, my friends, relatives, co-workers, and the occasional stranger, helped me to reach and then surpass my fundraising goal, bringing in a total of $2,137. As part of the Northern California chapter of Team in Training, you helped to raise over two million dollars for cancer research during the winter season alone, funding six Bay Area scientists to research blood-related cancers exclusively for the next three years! So for myself and on behalf of the 100,000 Americans who will be diagnosed with leukemia and related cancers this year, thank you! 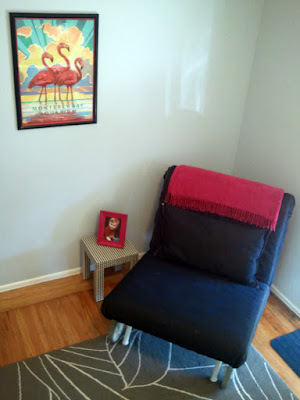 This week, I carved out some time to put the finishing touches on the office/studio makeover I mentioned in this post from July. Yep, that's right - it only took me two months to finish. You know how when you go on vacation they say you're on "island time". Well, my friends, welcome to toddler time. 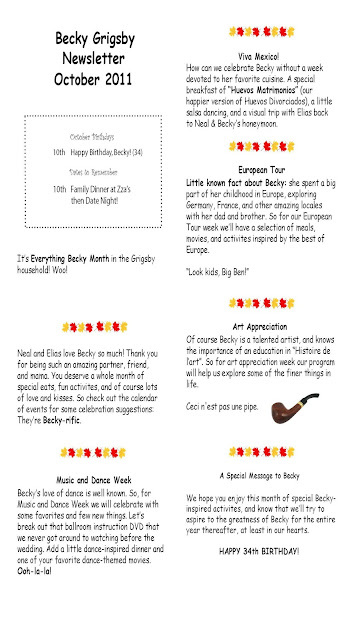 Anywho, before said toddler gets home from preschool, let me take you on a little tour! First, the office/studio half of the room...The main change is wall color, changing the paint from a dull off-white to a cool gray, specifically Behr Ultra Polar Drift. The color is a bit more blue/violet than I anticipated but I've gotten pretty used to it over the last couple of months. 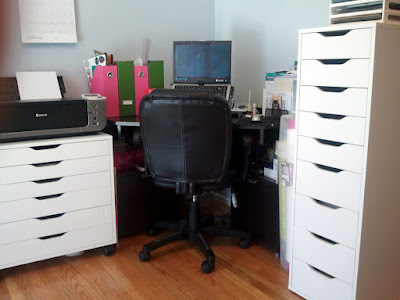 While I've generally been trying to work with furniture we already have, I did add a couple of key items that have drastically improved my paper storage strategies, namely the printer stand and 9-drawer unit from the Alex series at Ikea. 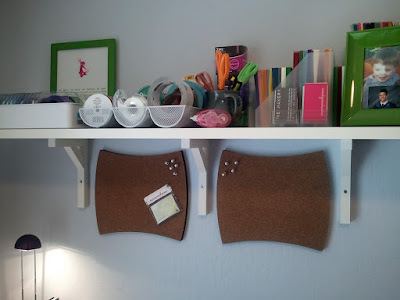 I've recognized the printer stand in particular in a number of studio images over the last few weeks on various blogs I read so I think it must be a popular solution for anyone who works with flat paper. 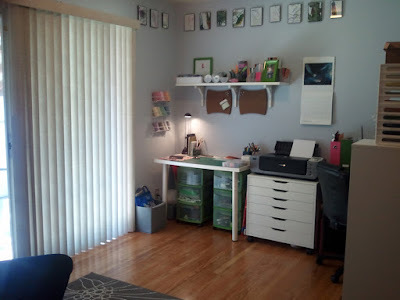 This corner I've kept pretty simple/bare for now because I'd really like eventually to have either more wall shelving/storage over my desk or a new desk altogether, preferably one with a hutch. I'd also like a new laptop and/or monitor. Okay? Thanks. To the left of the printer is my work space, where I assemble new designs, custom orders and the occasional felt project. The green bins underneath are new - one is for felt and the other one is for...everything else, mostly all my paper punches, various embellishments, stamps, ink pads, and miscellaneous craft supplies. 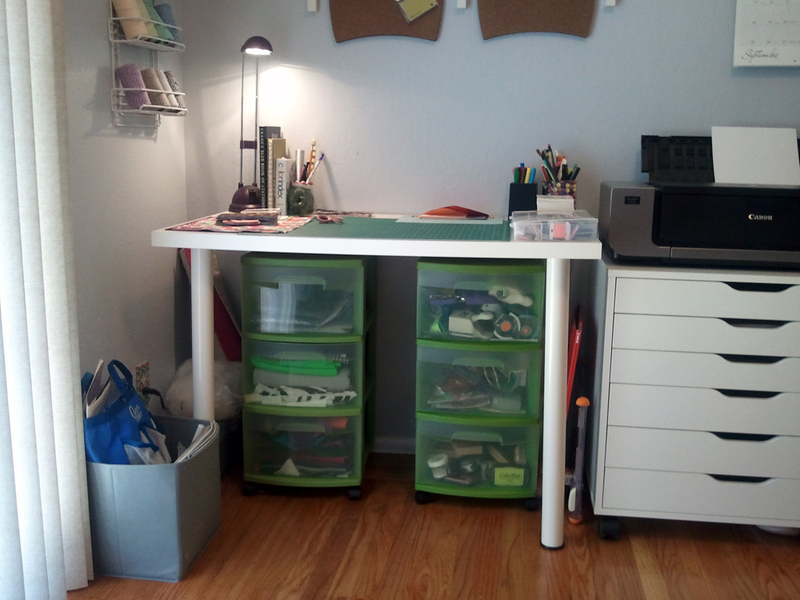 The space is a little small but works surprisingly well so long as I can keep my work surface clear (that part is a little harder to accomplish). 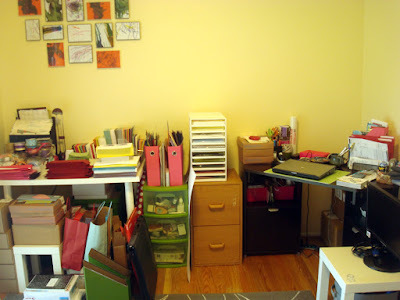 As you can see there are still a few items on the floor that I'd eventually like to move off the floor, and what you don't see in these images are the boxes and boxes of envelopes and a three-drawer unit of 12 by 12 inch paper in one-half of the room's closet. 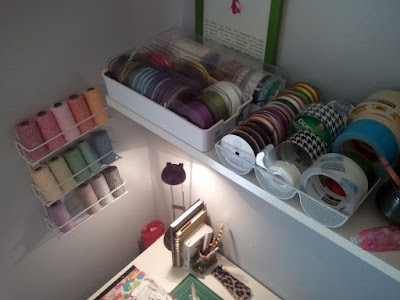 I do have a little bit of wall storage, though, in the form of this single shelf, which holds my loose envelopes that I use for new designs, samples, and paper proofs, plus my ribbon and adhesive. The three support thingys underneath the shelf were really bugging me, so I bought a couple of cork boards to fill the space for tacking up various materials that might inspire a new design or project. Most of the storage containers I've purchased over the last year or so are from The Container Store, which is like crack for the well-organized (or those who just aspire to be) - their prices are criminal in most cases and yet I bought not one, but two envelope holders for fifteen bucks a pop. 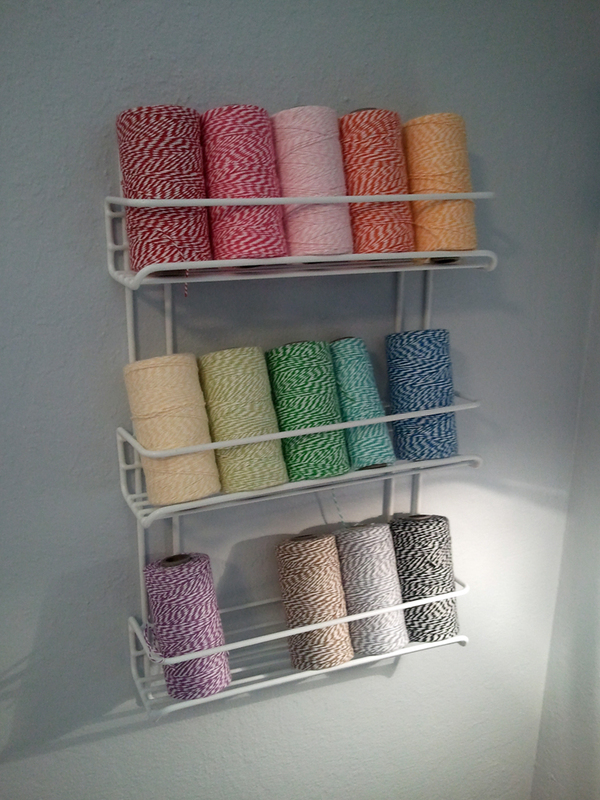 But occasionally I find something on sale and/or a storage solution in a product designed for something else completely, like the three section tray holding my ribbon and rolls of various kinds of tape, or the spice rack I'm using for all of my baker's twine, both found (on sale!) in the kitchen section. Let's take a closer look at that spice rack, shall we? Now those are my kind of spices! Pretty fantastic solution to my Twinery habit, if I do say so myself. The other side of the room is pretty minimal, functioning as guest space for, mostly, my mother-in-law when she comes to visit every couple of months or so. But wait, there's more! 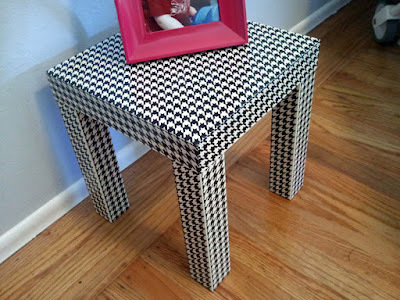 Is that a houndstooth patterned side table, you ask? Why yes, yes it is! 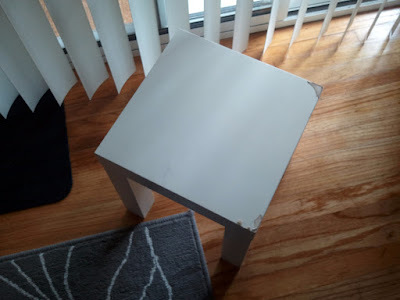 The small white table that was there was just bugging me, what with its boring plainness, not to mention the goo left by corner protectors (baby #2, should we reproduce again, might just have to learn to avoid sharp corners the hard way). So I covered it in duct tape! 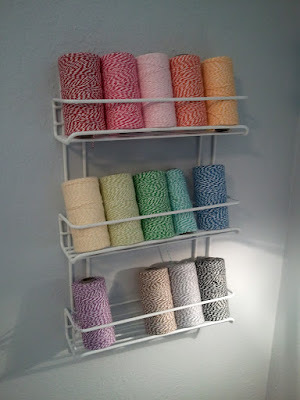 $4.99 at Michael's and - voila! - you have yourself a new side table. In closing, let me just say how much I love this room, this room of my own (kind of). It only took me a year or so to completely kick my husband out of our supposedly shared office (bwahaha! ).